i'm not entirely sure why i have corn syrup in my cabinet. i bought it in the last few months. i used some of it, i know because there is only a 1/2 a bottle left. but i can't, for the life of me, remember what the heck i used it for. that kinda stuff drives me crazy! how bout you? anyways.. yesterday i had this 1/2 a bottle of light corn syrup (that i have no idea why i have) & a bag of semi-sweet chocolate chips (that didn't turn into fudge for valentine's day) staring me in the face. they were saying put us in something yummy..
truth is.. the kitchen was finally clean & it just felt unnatural, so i had to dirty it up. i tried to find an internet source for this exact recipe, but came up short. it's from a 2005 country living magazine.. it was contributed by fairfield grocery & market. 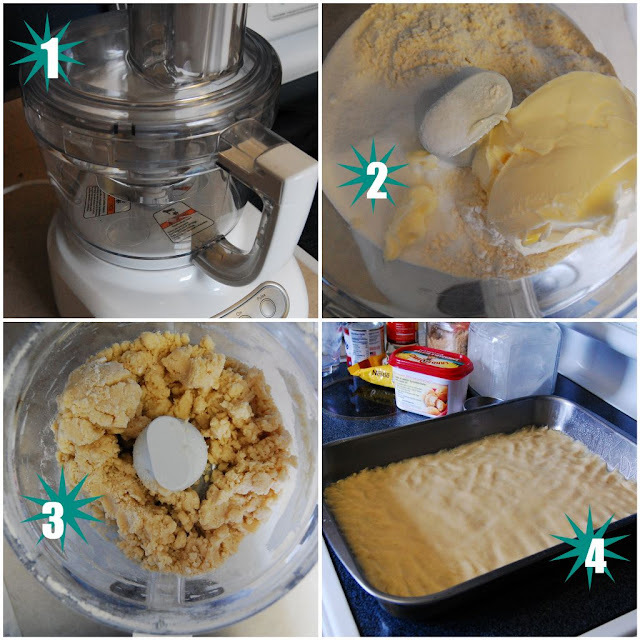 it's really SUPER DUPER easy..
2. add 1 cup butter, flour(s), and sugar to food processor. 3. pulse 10-15 times or until crumbly. 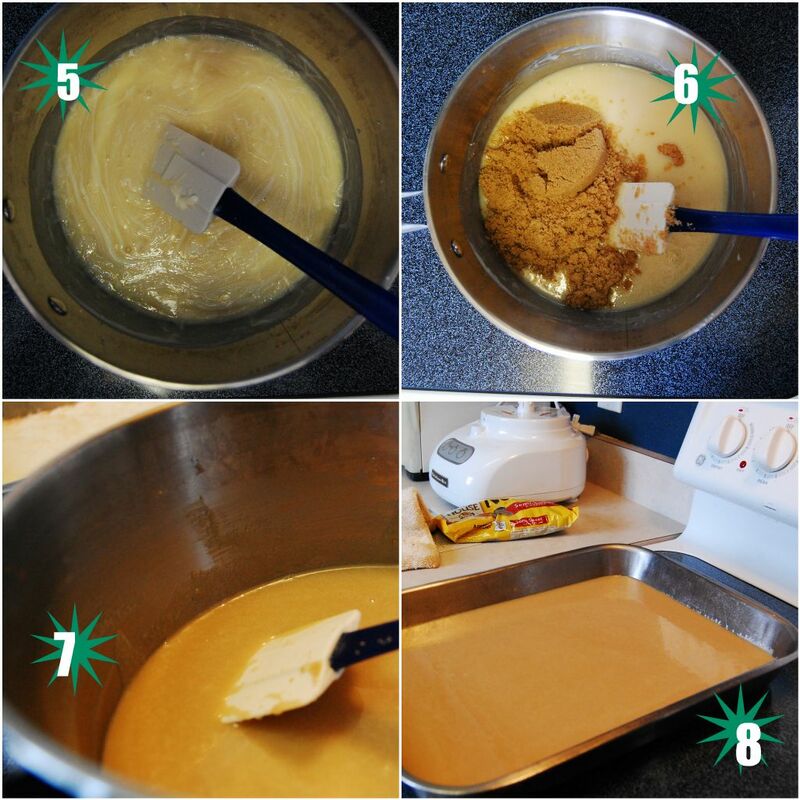 4. press mixture into a 15x10 inch jelly roll pan coated with cooking spray. (yes. i know it's not a jelly roll pan in the picture.. i don't have one..) bake at 350 for 18 to 20 minutes or until light golden brown. 5. stir together remaining 1/2 cup of butter, condensed milk, and corn syrup in 2 quart heavy saucepan over low heat 4 minutes or until butter is melted and mixture is blended. 7. stir and stir and stir and stir. 25 minutes. keep stirring. 9. (i apparently stopped taking photos here.. ) microwave chocolate chips per the instructions on your bag. stir until smooth. spread evenly over top of caramel layer. it will be a thin layer. cut into squares. makes 3 dozen. ﻿and you have millionaire shortbread. honestly. you can stop at the shortbread layer if you so choose to. this does look amazing. Nicely written tutorial, too! I have a half bottle of cornsyrup in my pantry, too. First half was used to make marshmallows. Wowzers, that looks yummy! And so easy to do. Thanks for sharing this mouth watering recipe. I'll have to try it...whenever I find that corn syrup bottle that I'm quite sure I have somewhere. Boy, does this ever sounds scrumptious! I am bookmarking this recipe for sure. Might have to use it on an upcoming Cookie Time Tuesday. So yummy!! Thanks for sharing! My caramel never sets either! Annoying, but still tasty. And the chocolate... Great shortbread.